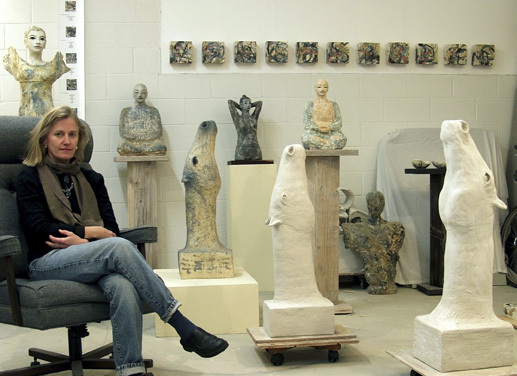 Amy Evans McClure creates "spirit guides" through her sculpture: figures, horses, goddesses, buddhas, abstract shapes. She began life in New York, was illuminated by Arizona mountains and mesas, now her art grows near forests and ocean in the Bay Area of northern California. Evans McClure's most recent sculptural commission is installed in The Bancroft Library, University of California Berkeley. Art in America editor Michael Duncan contrasts her artwork with Kiki Smith and Louise Bourgeois in his essay, introducing the newly released book Amy Evans McClure: Space In Situ. Amy lives in the hills of Oakland, with horses nearby and freeway roars below. the copyright of all art images belongs to Amy Evans McClure. ©2009 Amy Evans McClure, inc. all rights reserved.